Gelsenkirchen - With so much riding on Raffael’s 87th-minute penalty kick in Saturday's crunch game at the top, Schalke 04 coach Jens Keller just had to look away. Only when he heard the deafening cheers resonating from the four walls of the Veltins Arena could he turn back to face the field of play and enjoy the final few minutes of an emotionally-charged encounter between third and fourth in the Bundesliga. “I can’t watch when something like that happens,” he admitted afterwards. Trailing by two Leverkusen goals with just 20 minutes to go, the Royal Blues didn't back down, but instead, according to defender Benedikt Höwedes showed "great character", getting their reward in the form of two unlikely second-half goals. There was praise from Timo Hildebrand, too, but his compliments “for the great morale shown” did not mask his fear that, next time, they might not be so lucky. 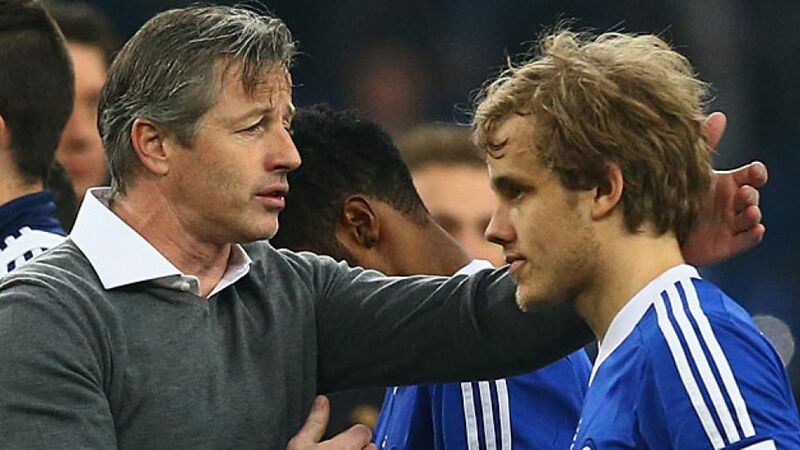 “We can’t rely on always getting back into games like this,” said the Schalke goalkeeper. Nevertheless, it felt much more like a point gained than two lost, especially considering the players Keller did not have at his disposal: Jermaine Jones, Jefferson Farfan, Klaas-Jan Huntelaar, Ibrahim Afellay and Roman Neustädter representing only half of the ten players ruled out on Saturday evening. “We almost had more players out than we had on the field,” said the coach. Failure to take all three points off Leverkusen could therefore quite easily be regarded as a great success. “When I started here in winter, fourth place was the aim and we’ve now cemented that with this point,” added Keller. Cemented, but not cast in stone, with five games still to come and the potential for even more drama down the back straight.